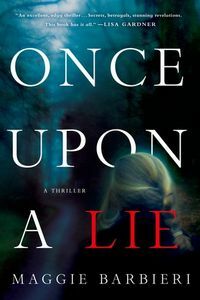 Once Upon a Lie by Maggie Barbieri: Synopsis and Online Purchase Options. Synopsis (from the publisher): Maeve Conlon's life is coming apart at the seams. Her bakery is barely making ends meet, and one of her daughters spends as much time grounded as the other does studying. Her ex-husband has a new wife, a new baby, and a look of pity for Maeve that's absolutely infuriating. Her father insists he's still independent, but he's slowly and obviously succumbing to Alzheimer's. And now, her cousin Sean Donovan has been found dead, sitting in his car in a public park in quiet Farringville, New York, shot through the head.